Dracut Rotarians, along with Dave and Candice Talbot, were on hand on Saturday to pack mobility devices from Pennsylvania and New York, along with those collected in Dracut from clubs throughout District 7910, into a 40’ container that will soon be loaded onto a ship headed for Uganda. Members of the Tororo Rotary Club will be on hand in Uganda to receive the crutches, canes, walkers and wheelchairs so that they can be distributed to people who desperately need them as soon as possible. Dave Talbot, a Denver resident and member of the Mountain Foothills Rotary Club of Colorado is himself a polio survivor. A photographer and filmmaker, Dave encountered a polio victim while shooting a documentary in Uganda. She was crawling on her hands and knees. The sight of this woman was the inspiration for the Crutches 4 Africa program. Talbot’s goal is to ship a million mobility devices to the victims of polio, injury, accidents and land mines in Africa. 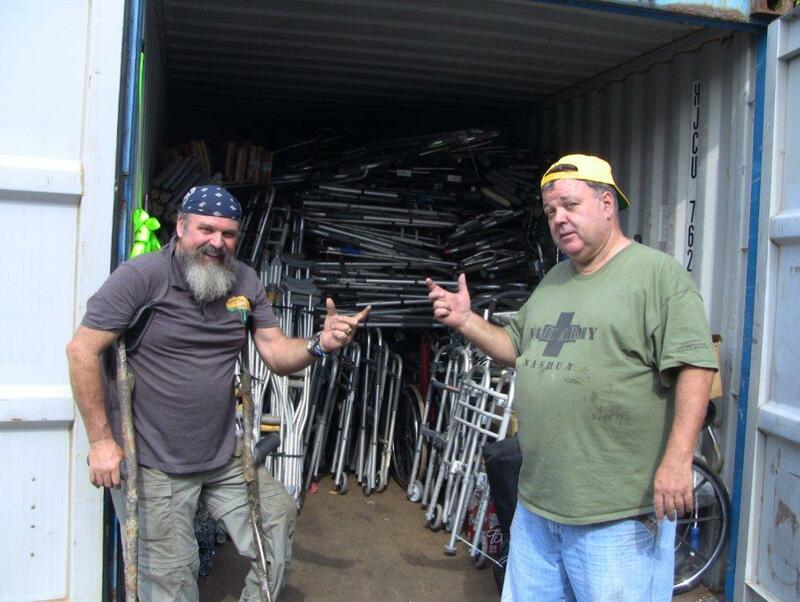 Chuck Moran of DRC heard about Crutches 4 Africa at the RI Convention in New Orleans and brought the idea back to his fellow club members. It took off and a little more than a year later, Dracut has become the collection site for donations from Massachusetts, Maine, New Hampshire, New York and Pennsylvania. Talbot and Moran acknowledge that there is still about 6 feet to go before the container is filled enough to get it loaded on a ship headed for Africa. “Lets finish this and get it sent off to Uganda, said Talbot. If you have mobility devices, or want more information on how to become involved in this effort, contact chuckmoran@comcast.net as soon as possible. This entry was posted in Crutches for Africa. Bookmark the permalink.